This week I have been doing some serious embellishing so I thought I would explain firstly what I did to cover this mistake. 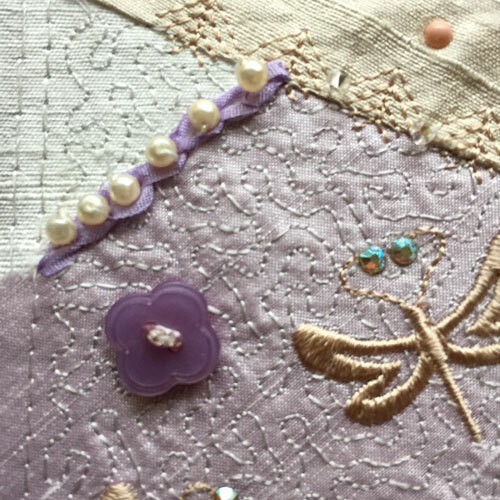 Selecting some mauve silk ribbon which was 2mm wide I stitched a line of chain stitches and then added seed pearls into the middle of each chain. 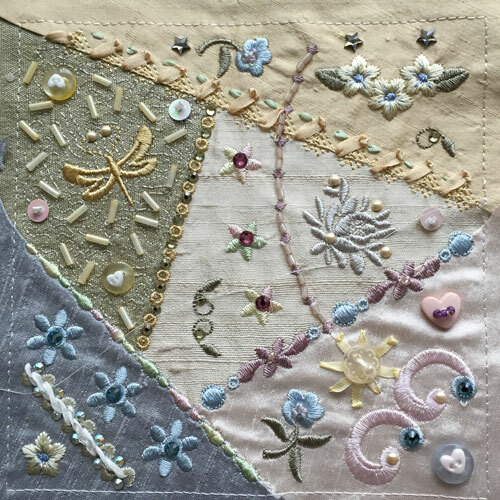 Initially I was disappointed with this block and the colours that I had chosen but once I began planning the embellishment it all started to come together. I spent several hours embellishing this block, experimenting with buttons and beads, and of course plenty of crystals. Note the little hot fix crystals on the antennae of the dragonfly. Coral coloured pearls and antique glass seed beads looked great emphasizing the coral pink silk dupion. I found some light purple seed beads which I stitched in the centres of the little Harriet flowers. A sweet little coral coloured teddy bear button fitted my colour scheme perfectly and I also attempted another silk ribbon rose in the same mauve silk that I made my repair in. As the buttonholes are not in a straight line I decided not to cut them but place small pink buttons between them instead. The grey roses were given small hot fix lavender pearls. However my real excitement is in discovering the usefulness and beauty of silk ribbon embroidery. I treated myself to a couple of books on this so I can view the series of necessary stitches on my iPad. The hardest part is securing the ribbon at the beginning and the end, and not getting the ribbon twisted! Some of my buttons had seed beads threaded through the eyes too. As you plan your embellishment placement use the lines of embroidery stitches for accurate positioning of small bugle and seed beads. Here is the finished block but I am now keen to create something with it rather than just collect a series of blocks so I think I may make it into a small cushion by mounting on some taupe brown silk dupion. That will have to be another posting because I want to share the embellished smaller block which is 5″ square. 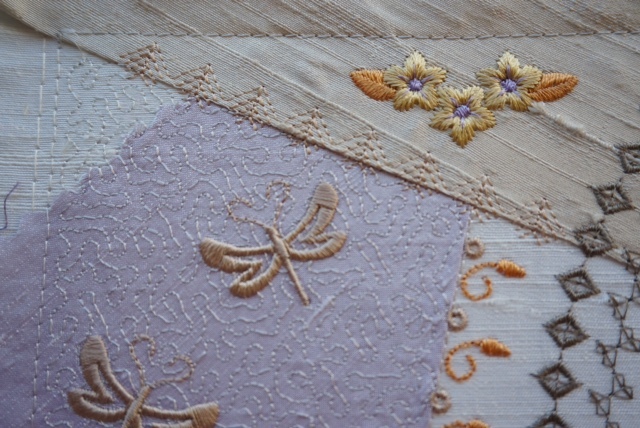 On this block I used the embroidery stitches for as guide lines for silk ribbon embroidery. 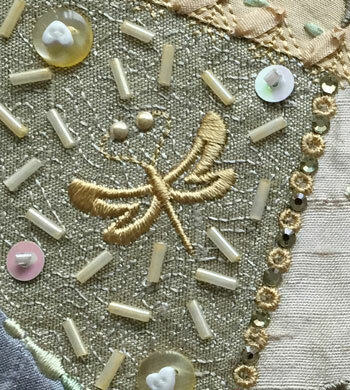 I added some sequins with a seed bead in the top to hold them in place and attached lots of lemon coloured bugle beads around the dragonfly. The row of ribbon embroidery shown here is a series of ribbon stitches where you put pass the needle through your ribbon and hold a small loop with a thick needle. The small green stitches were colonial knots but some disappeared as I pulled too tight! 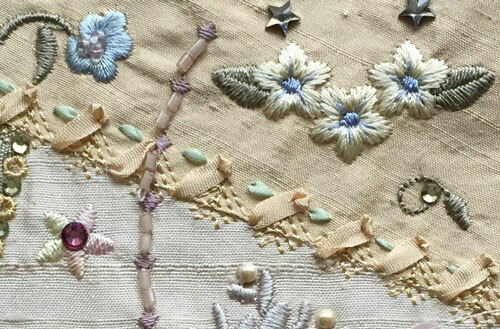 Below you see a few overlapping ribbon stitches and lots of AB crystals placed along the wavy lines of embroidery stitches in the lower left corner. Here is the finished quilt block. I hope these photos and experiences have inspired you. I have just completed my next quilt block for Valentines so that now needs embellishing too! 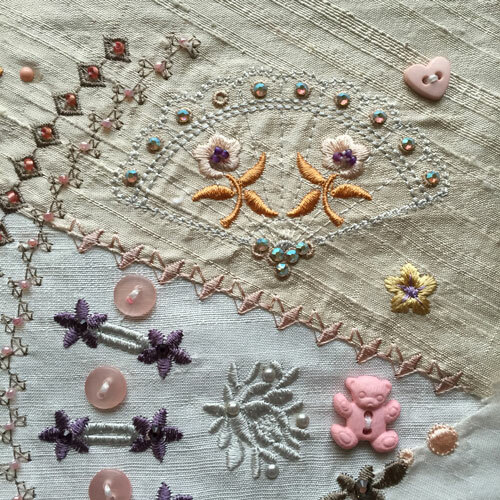 This entry was posted in Embroidery projects and tagged Crystals, Embellishment. Bookmark the permalink. 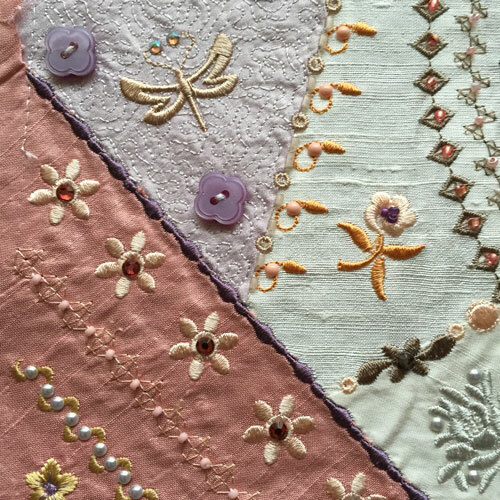 8 Responses to Repairing and embellishing my Crazy Quilt 3. Wow! That is so gorgeous! Thank you so much for commenting. I am so glad you love the designs. Please read the end as I published it by mistake before completing and editing the post. Exquisite is the only word I can think of to describe this very lovely piece. Wait until you see the next one for Valentines! Oh, Hazel! You most definitely have inspired me. 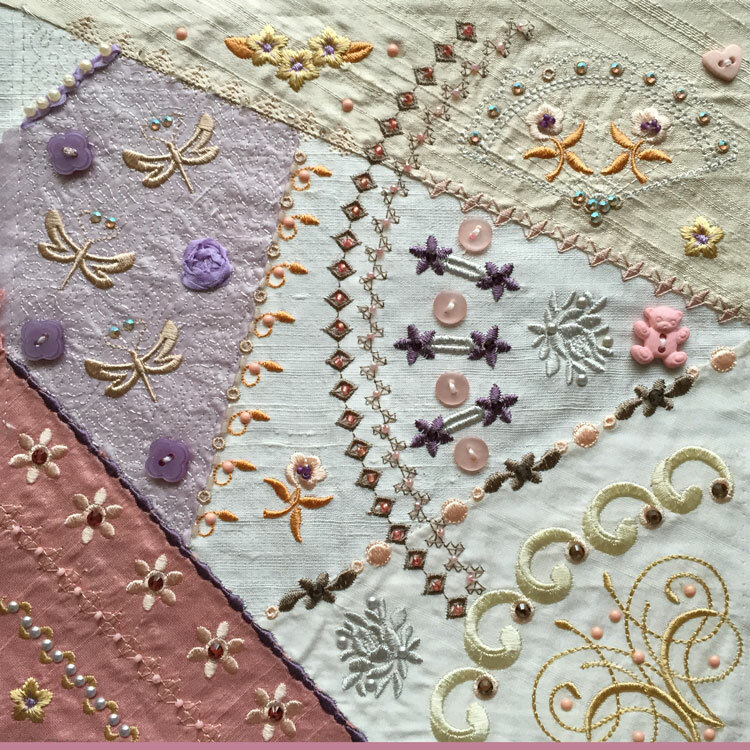 I have never cared for crazy quilt blocks but you’ve completely changed my opinion. It’s so beautiful! I’d love to do a whole quilt but I only have a 5×7 machine. Absolutely beautiful Hazel. I hope to do one of these quilts next winter. All I need is a little imagination. Please keep posting. I can’t wait to see the rest of the blocks. Hazel, you are a true artist. 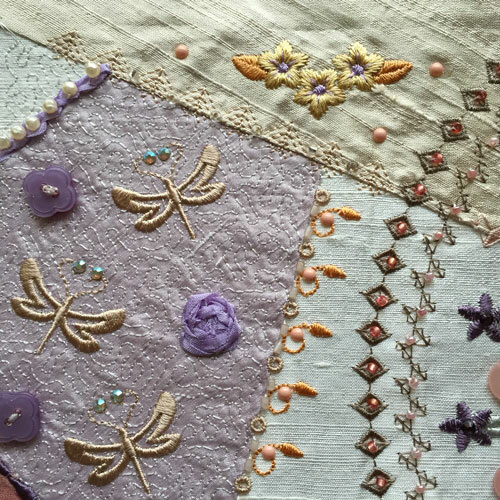 I just love the heirloom feel of the crazy quilt block. I can’t wait to see new ones. This is so very lovely; I love your combinations of colors and textures. You are an Artist!